In the handling and processing system for the various “food liquids”, TREESSE Progetti acts on the automation engineering and supervision aspects, and thanks to their extensive experience in this sector they are able to provide client/server communications systems, multilevel communications networks and automation systems with high level configurations upgraded to the components and structures requested by the market. The proposal begins with managing the raw materials and continues through to the interface with packaging, after passing through the typical process in each sector. Beer, spirits, wine, soft drinks, mineral water, fruit juices and sauces are the main business fields. The skills that have been obtained by the relevant technologists and the exceptional technical/managerial preparation of the engineers working on the various projects, enables the company to create high level automation control rooms. Know-how of processing the raw materials, mixing and cooking the mixtures, fermenting the must and filtering the beer is just one example that TREESSE Progetti is known and appreciated for. The request we received was to produce an automatic system which would guarantee safety, reliability, ductility, simplicity at a low cost. The end Customers were located worldwide, and therefore a great deal of attention has been paid during the design phase in order to ensure the necessary requirements. The final solution should therefore live up to the constant technological growth and produce the lowest possible post-sale impact. The automated system was designed starting from the experience gained in the sector, by applying concepts and patterns conceived by the Technologist and building a synergic relationship with Velo Spa. Special care was paid to reference standards, environmental and usage conditions when designing the hardware. The technological process was broken down to its minimum components in order to develop algorithms which would allow on the one hand to reduce costs by eliminating unnecessary hardware components, and on the other to ensure accuracy and speed of reaction by immediately identifying the critical points of the system. The automated process was tested in our offices in the presence of Velo Spa and of the end Customer, simulating actions and reactions and granting the users the actual view of the finished product even before the start-up. • the possibility of quick changes and actions thanks also to the large and detailed supporting documentation. • the success of the operation was represented by the satisfaction of both Velo S.p.a. and the end Customer. The possibility of simulating the entire process. The use of proven, secure software structures. The use of algorithms determined by the analysis of the actual process. • VELO SpA: complete wine systems for transforming grapes into wine. 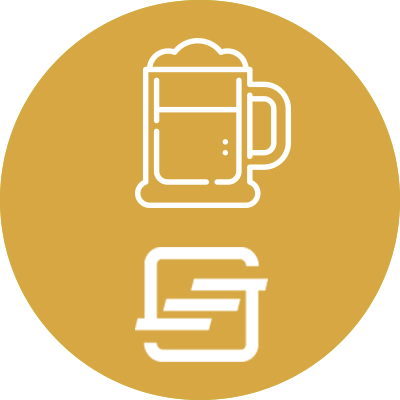 • FOODING Gmbh: design and construction of industrial micro-breweries for pubs and industrial breweries. • SIDA SpA: primary and waste water treatment. 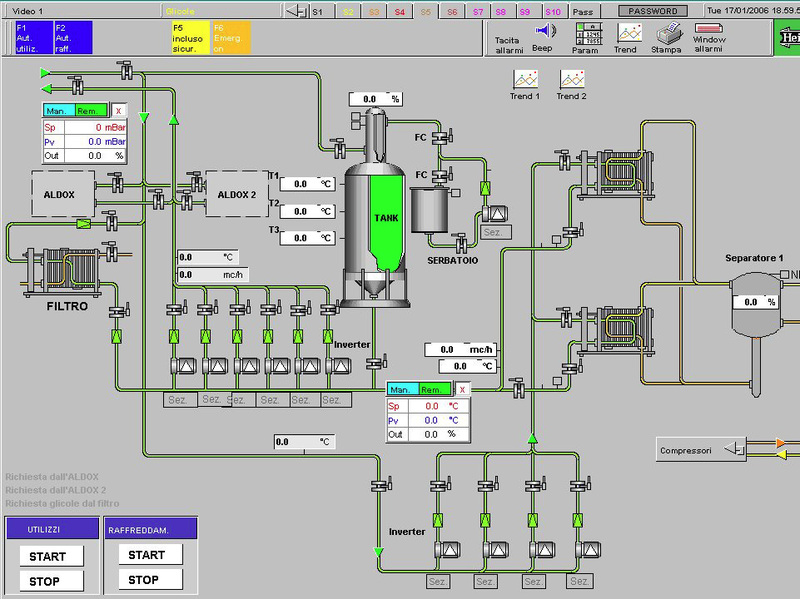 To perform the software revamping of the entire service sector of the plant in order to standardise processes and controls as well as the graphic interface without impacting on normal production activities. Contextually to the revamping, the need arose to implement plant areas which were still 'invisible' at a synoptic and data level. In order to solve this problem we organised various operations designed to test every zone in detail for each area involved by the revamping software. The task required an high level of coordination so we created a team with different skills. Our presence at the customer’s site was necessary in order to collect as much information as possible, thus reconstructing the history of the various systems and identifying the critical points. 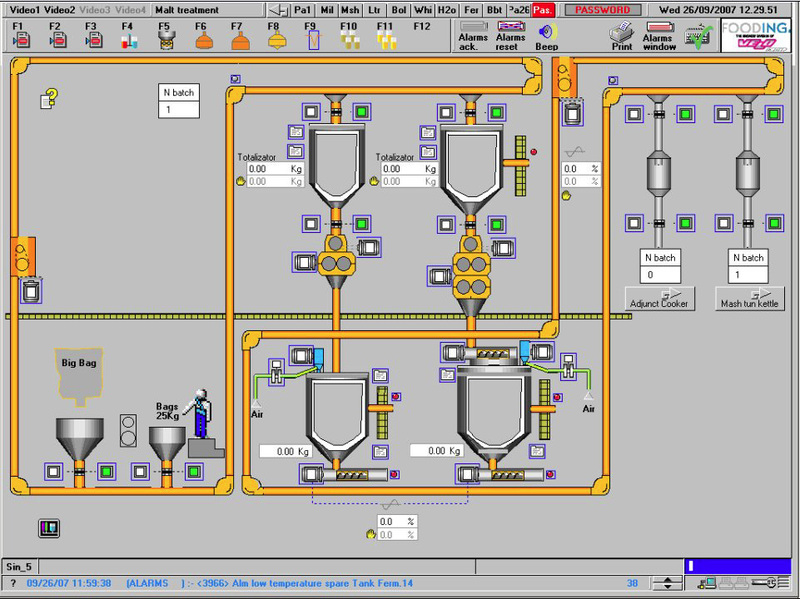 On this basis we began designing the new software which, piece by piece, was tested directly in the production cycle of the Plant. Then we developed the stand-alone software parts which allowed immediately an effective operation when it is combined, without stopping the production cycle. The start-up occurred without causing any problems to the production cycle. The customer was able to schedule and organise the time intervals reserved for testing, thus avoiding any production problems. The operators of the various departments immediately mastered the new system thanks to the progress in small stages tested during the period prior to the start-up. It was possible to deal with data hitherto untreatable thanks to the use of a Database extended to every analogue signal. The ability to analyse and apply the best strategy starting from existing conditions. Heineken is an international group which manufactures and distributes its products to more than one hundred and seventy countries. Its head office is in Amsterdam. The beers of the Group - Heineken and Amstel - flank the production of local beers made by its subsidiaries throughout the world.